I occasionally get questions about goat health issues. I’m amazed that people ask me as there are so many bigger and probably more reliable sources! I guess I should feel honored that some people value my input. I’ve never had goats until about 1 1/2 years ago but I’ve learned so much from my goats and by spending a lot of time searching the “net” to get answers to my queries. Over this past year I’ve met many goat “experts” that have also been excellent resources in times of need. The thing that amazes me is that I never get feed-back from the folks that write to me. On several occasions I’ve emailed the reader to ask for a follow-up and never got a reply. It’s very frustrating not to mention that I find it quite rude. If I take time from my busy schedule to answer your question (and sometimes I don’t know the answer but I’ll research it for you), please be kind enough to provide a follow up. If you have something you’d like to ask me, feel free to do so but please, return the courtesy & provide me with a brief follow up! You don’t need to write a novel but if you wrote to me thinking your doe was dying, it would be nice to know if she survived or not! Know what I mean? thanks. they dont have patches.the one doe had one patch on her side now the hair is coming back,and they do scrtch more then usual.i though it was from the dry skin.and they have water i change it every day . i feed them hay, goat feed. and they eat grass every day.maybe a good bath.might help.and some baby oil for the dry skin.i gess i can try it and see . so thangs you for your time. ps you you have very nice looking goats. they look so sweet. Don’t bathe your goats.. they really won’t appreciate that. Sometimes I have to rinse little goat butts and it makes them miserable! They hate being wet! Don’t put baby oil either, that will just attract dirt. One final thought… are your goats wormed regularly? I’ve noticed that many times my goats coats are shinier a few weeks after worming. You should worm your goats at least at the start of every season. You may also want to brush them every so often.. they’ll get used to that very quickly. I agree with the worming and treat for lice also. Goats are incredibly suseptible to lice. I treat my goat for lice every month. She got them really bad one time and mildly a few times after that. i have three black pygmy goats . i have had them for two years now. about three mos. ago i seen a bold spot on my doe about four ins round. so i went an got some zipcide dust from our feed store.i have put it on them five times now .i think it was round worms. but now there skin is very dry. they have alot of flakyskin you see it all in there fur white dandrift.and the under coat is coming out. my question is could the dust be making there skin dry out? or do they have mites when a cant see none. all three have the flaky skin. I did a quick search on your issue and couldn’t find anything special. I suspect ringworm but that would only be in patches. I got rid of ringworm very quickly using a solution of 50/50 water/bleach & I’d rub the areas once or twice a day & let dry. Within a week it was all gone. Have you tried a gradual change of diet? Do your goats have continued access to water? Are they scratching more than usual? If they had mites, they’d be scratching quite a bit. Wish I could be more helpful! Would love to know where to get very basic goat care, etc. I have llamas, , and we had two pygoras for a year several years ago. We’ve moved to Colorado, and several folks have mentioned goats are great for brush-clearing. Hubby has finally agreed that a few goats might be a good idea. BTW, I promise to write back! Kris, on my website I list a few sites where I get some info. The problem with these sites is that they really take goat keeping to another level. Had I read these sites before getting goats, I probably would have stuck with chickens! Goats are very easy keepers and I find that if you feed them good food, you’ll rarely have problems. Most people don’t give their goats grain… I do – just a little & it keeps their coat shiny but most important for me is that it keeps them FRIENDLY! I use the simplest methods and what works for me. As for clearing brush, you’d do fine with inexpensive “brush goats”… Make sure to worm them quarterly and protect them from rain and coyotes and stray dogs and they’ll be happy to “work” for you! If you don’t want babies, then don’t get a billy! And don’t give these guys hay if you don’t have to. You’ll spoil them and they won’t want to eat your brush! 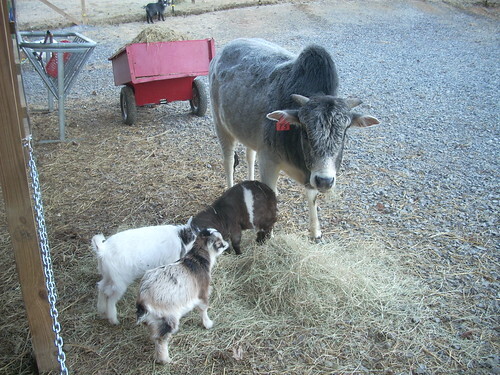 Check craigslist in your area – you may find some good deals on goats!